In Monument to Civilization, Lin Yu-Ta proposes a dark, staggering architectural solution to the massive problem of urban waste. With space for toxin-emitting landfill in decline, Lin suggests that we might instead construct epic towers from that waste, and from that decomposing trash generate power for the world’s largest cities. 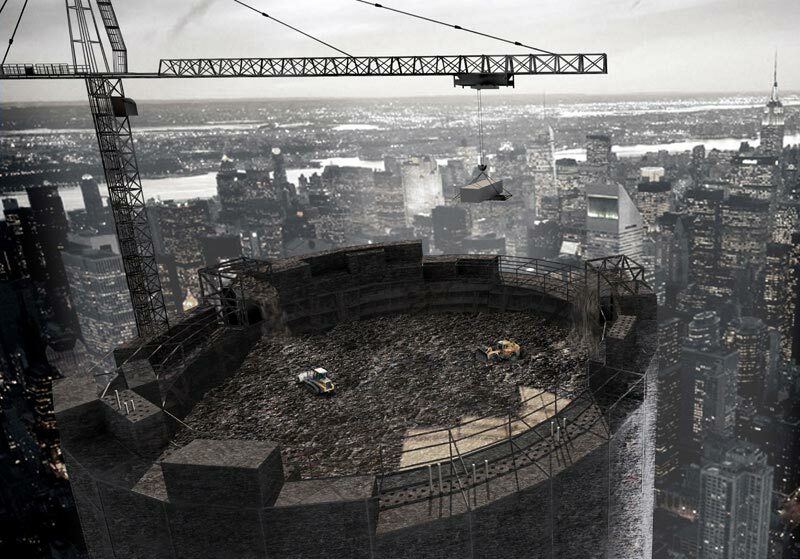 The towers would be massive – New York alone, Lin tells us, sends 2,372,000 tons of trash to landfills each year. That’s enough to construct a tower 1,318 meters high each year. 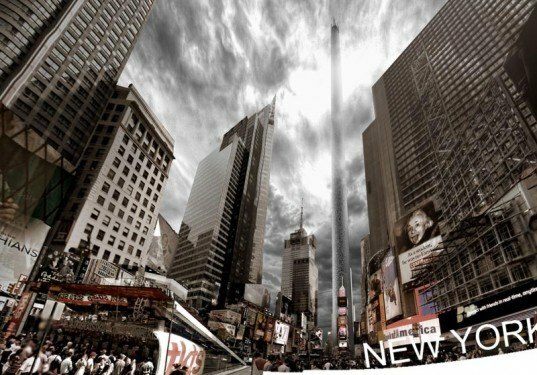 This ingenious, sobering proposal for sustainable energy was recently awarded third place in the eVolo’s 2012 Skyscraper Competition. When examining the notion of the skyscraper as urban spectacle, Lin Yu-Ta noticed that we often “build towers for towers’ sake.” The Taiwanese designer asks us to instead consider that our own wastage, often evident in urban development, is itself a spectacle worthy of note. If this hasn’t already left in a state of apocalyptic depression, Lin points out that “a large portion of our garbage would last for hundreds or even thousands of years… making it the greatest material for a monument.” But the proposed towers would serve to remedy that wastage. In addition to producing power from the gases emitted by decomposition the structure would also house gas stations, recycling stations, wastewater processing and storage facilities, as well as a factory to build more bricks from trash, adding to the ever-increasing height of the landfill tower. The proposal to place these towers in urban centers, towering over our greatest architectural achievements, certainly carries a message to surrounding populations. But the proposed locations — New York, Dubai, Shanghai and Taipei — are not purely political. By creating energy producing landfill in urban centers, we could reduce the environmental impact generated by transporting trash away from its point of origin. In Monument to Civilization, Lin Yu-Ta proposes a dark, staggering architectural solution to the massive problem of urban waste. With space for toxin-emitting landfill in decline, Lin suggests that we might instead construct epic towers from that waste, and from that decomposing trash generate power for the world's largest cities. The towers would be massive - New York alone, Lin tells us, sends 2,372,000 tons of trash to landfills each year. That's enough to construct a tower 1,318 meters high each year. This ingenious, sobering proposal for sustainable energy was recently awarded third place in the eVolo's 2012 Skyscraper Competition.